Farts are intestinal gases that pass out through the body via backward passage. Everyone farts, but a fart gets disgusting when its awful smell peeps in anyone’s nose and shakes the senses. Considering the same, farts are often ignored as unpleasant things to gain knowledge about. So, here are some interesting facts that you absolutely didn’t know about farts. 1. An average fart is made up of nitrogen, hydrogen, carbon dioxide, methane, oxygen which are odorless gases and comprise 99% of a fart. Whereas, 1% is the hydrogen sulfide, the smelly part. Such a small fraction creates a huge distraction! 2. If you fart regularly for 6 years and 9 months, gas constituting energy of an atom bomb will be produced! 3. The awfulness of a fart varies from vegetables to non-vegetarian foods. Meat and eggs create the most stinking smells. While cauliflower, beans and cabbage are still bearable to some extent. 4. 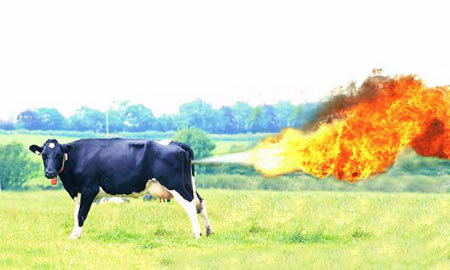 Farts are flammable as they contain methane and hydrogen. A fart has a temperature of 98.6º Fahrenheit. That’s hot! 5. Farting continues even after a person dies. The gases resume to escape from both ends of the digestive tract, resulting in burping or farting noises. This happens because of muscles contracting and expanding before rigor mortis sets in. This can happen after 3 hours of death. 6. The term ‘Professional Fart Smellers’ is used in china to refer to the bold men and women who smell farts to diagnose illness. The ‘fart smellers’ make up to $50,000 ! 7. Smelling fart can reduce the risk of cancer, dementia and arthritis as said by the University of Exter. This happens because of tiny amounts of hydrogen sulfide, which prevent damage to mitochondria, the powerhouse of the cell. 8. The female fart smells stinker than that of the male. This is because of a higher concentration of hydrogen sulfide. 9. The speed of a fart is directly proportional to the strength of sphincter muscles. The farts can reach up to a speed of 10 feet per second! 10. The termites are the most prolific farters. It is estimated that about 11% of methane emissions on the Earth are because of the gases passed by termites. In humans, farting can be controlled by a change in diet and lifestyle. But what stops an animal from the same is yet to be discovered.